2012-S1x, 2012 U.S. Spring Charity Seals Sheet, R12-EFAS-4-01. Sheet of 42 seals, self-adhesive, VF, MNH. Issued 2012 by the American Lung Association (ALA). Designed by Michelle Palmer. Images of Rabbits, Ducks, Basket & Daisy. 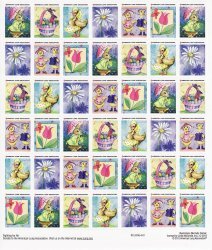 2012-S1x, 2012 U.S. Spring Charity Seals Sheet, R12-EFAS-4-01, self-adhesive, VF, MNH. Never folded, shipped flat. Issued 2012 by the American Lung Association (ALA). Designed by Michelle Palmer, licensed by Linda McDonald, Inc. Images of Rabbits, Ducks, Basket & Daisy. Sheet of 42 (7x6), SE4S, no union label. "R12-EFAS-4-01" on bottom margin. "Keep Your Lungs Healthy" on reverse of sheet. The American Lung Association (ALA) issues Charity Seals twice a year. U.S. Christmas Seals before, or at Christmas, and U.S. Spring Seals before, or at Easter. Spring Charity Seals are aso known as TB Seals, and are usually classified as Charity Seals, or Cinderalla Stamps.